The News Feed diplays the last events on your network, sorted by the time you received them. This gives you a summary of the activity of your friends. You can configure which events to show by pressing on Options. This shows an entry in the newsfeed because a friend came online, and this friend sent a message. 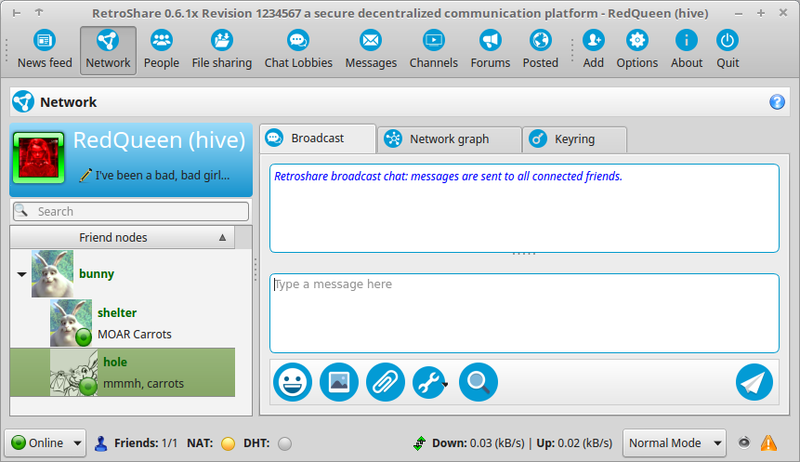 The Network tab shows your friend RetroShare nodes: the neighbor RetroShare nodes that are connected to you. You can group noed together to allow a finer level of information access, for instance to only allow some nodes to see some of your files. 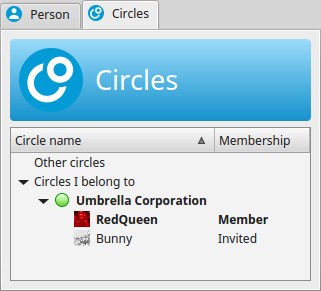 The Red Queen is having a friend in here Network/Friendlist. 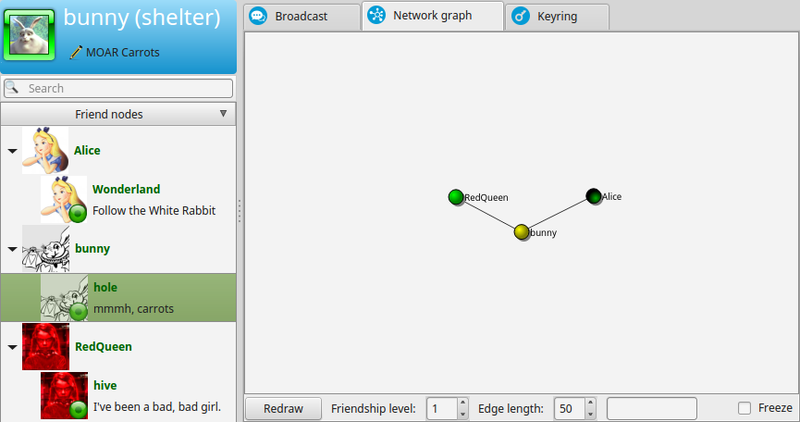 It's the User Bunny and RedQueen is connected to both of his Locations. Bunny runs two different locations. One for each of his device. The location shelter is running on his laptop, and the location hole is on his personal Computer. 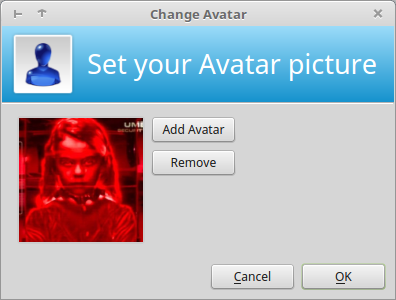 By clicking on the default Avatar Icon you can set your avatar picture to any picture you prefer. Only your friends will be able to see it. You can also change it later on. 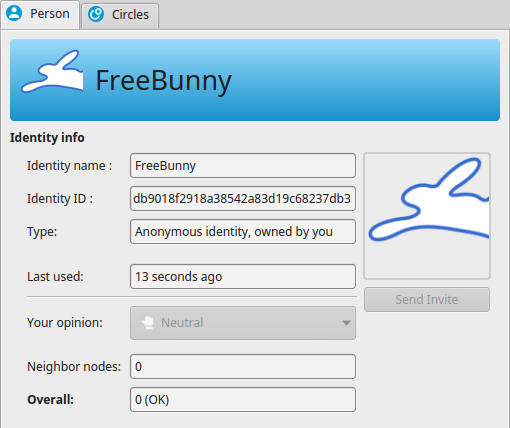 Your status message will be shown in the Network/Friendlist of your friends beside your Avatar. Friends are sorted by name or by state. 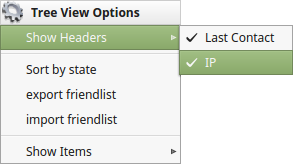 The columns with the last contact and ip can be enabled with right click. The Broadcast Chat sends a message to all online friends at once. The network graph shows all friends and their interconnections. Bunny has friended with Alice and RedQueen. 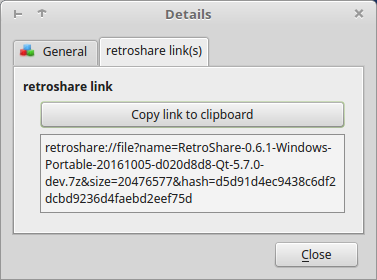 RetroShare collects keys from other nodes in the network, mostly forwarded by friends. 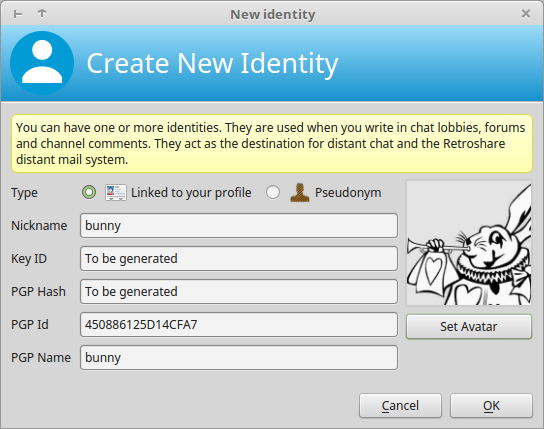 Identities are used to securely identify your data: sign messages in chat lobbies, forum and channel posts, receive feedback using RetroShare built-in email system, post comments after channel posts, chat using secured tunnels, etc. Two kinds of Identities can be utilized. 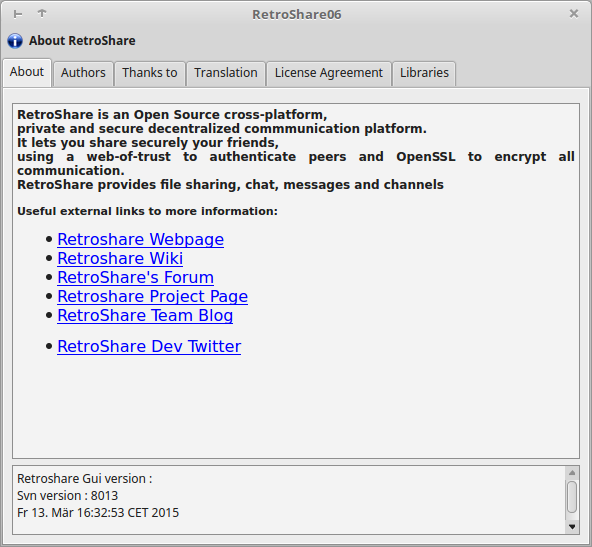 Identities can optionally be signed by your RetroShare node's certificate. Signed identities are easier to trust but are easily linked to your node's IP address. your Node User. But it's common. Each Identity has it's own crypto hash ID number. Last time the Identity has been in use. This can be a forum post or anything else. Your opininon on your owned ID is Neutral. This is used to rate other ID's for a reputation system. Ban all ID's from a specific node. Average opinion of neighbor nodes about this identity. Negative is bad, positive is good. Zero is neutral. Overall reputation score, accounting for yours and your friends'. Negative is bad, positive is good. Zero is neutral. If the score is too low, the identity is flagged as bad, and will be filtered out in forums, chat lobbies, channels, etc. Anonymous identities allow you to anonymously interact with other users. They cannot be spoofed, but noone can prove who really owns a given identity. Name of the Identity. Can be named anything. Circles are groups of identities (anonymous or signed), that are shared at a distance over the network. They can be used to restrict the visibility to forums, channels, etc. A circle can be restricted to another circle, thereby limiting it's visibility to members of that circle or even self-restricted, meaning that it is only visible to invited members. Private (a.k.a. self-restricted) circles are only visible to the invited members of these circles. In practice the circle uses its own list of invited members to limit its own distribution. Circles can be restricted to the members of another circle. Only the members of that second circle will be allowed to see the new circle and its contents (list of members, etc). Members of this list will be automatically proposed to join the circle (by accepting membership). They will not receive data that is restricted to this circle until they do so. 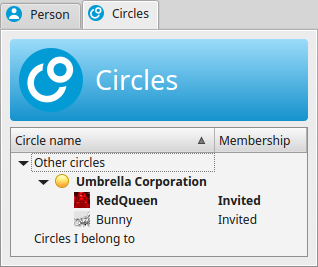 The circle name, contact author and invited member list will be visible to all invited members. 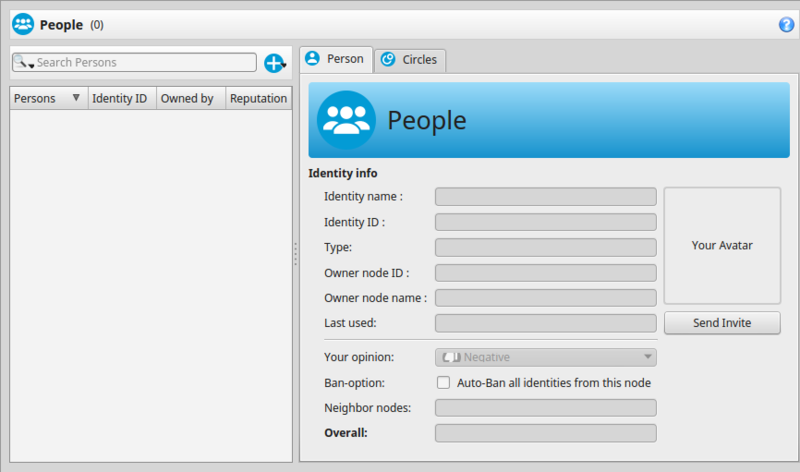 If the cricle is not private, it will also be visible to neighbor nodes of the nodes who host the invited members. In addition, file transfer is multi-source and allows swarming (you can be source while downloading). 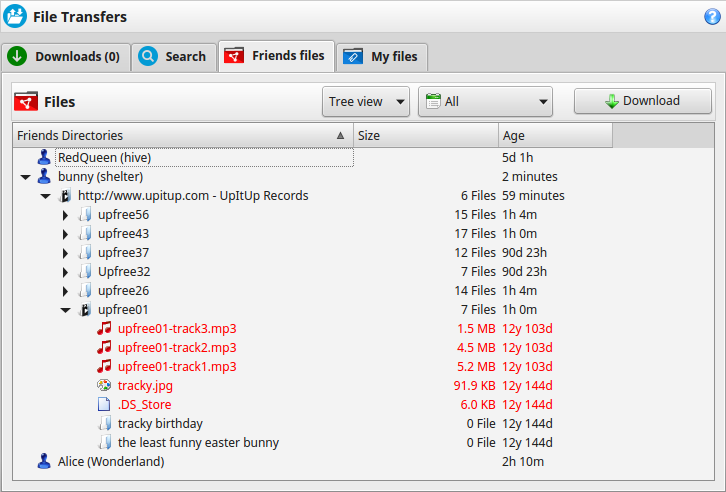 In this Screenshot, the files are not yet finished and still start to upload to other friends. 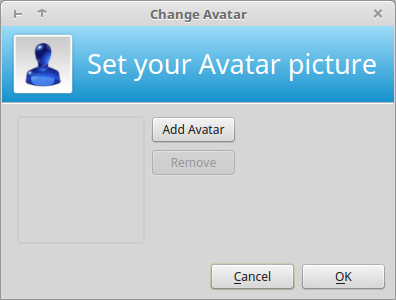 By right-clicking on the download, the Context menu provides actions to the user. show Details from the download. 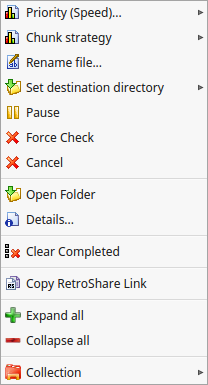 You can share files using the "Directory Plus" icon from the left side bar. These files will be listed in the My Files tab. You can decide for each friend group wheter they can or not see these files in their Friends Files tab. 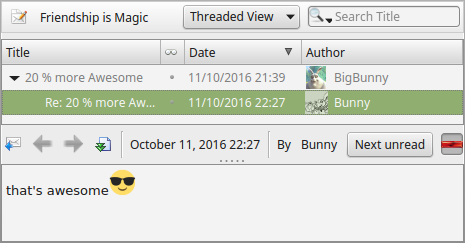 The search tab reports files from your friends' file lists, and distant files that can be reached anonymously using the multi-hop tunneling system. 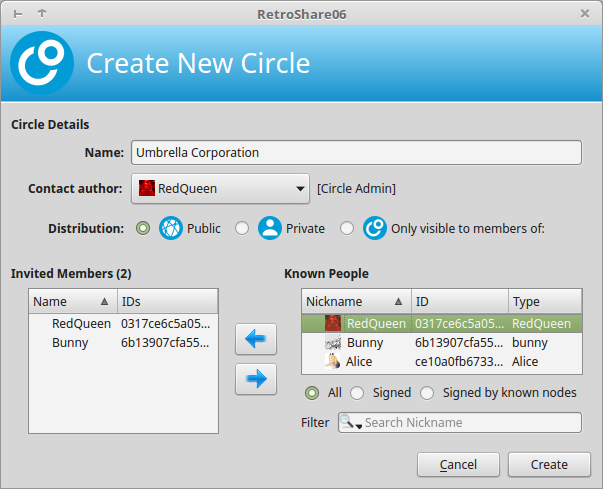 RetroShare can search in the Network for shared files. 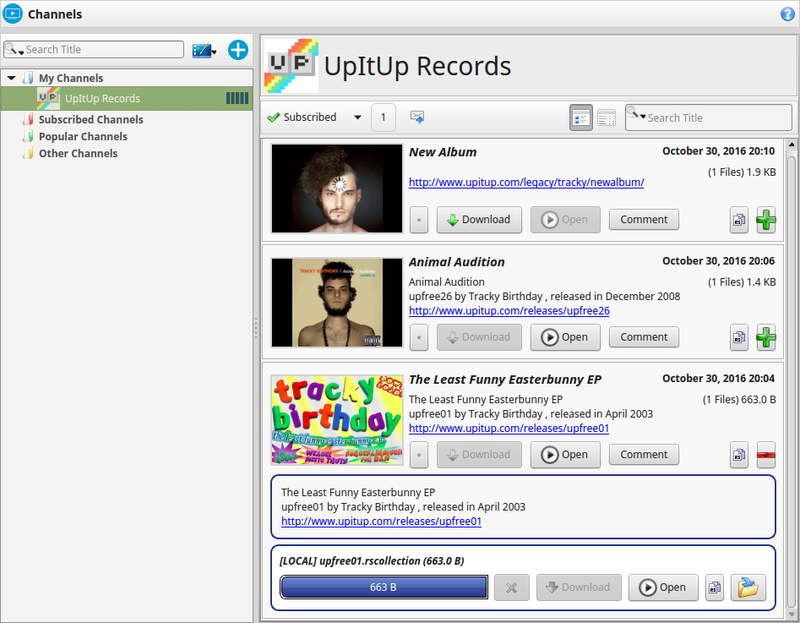 When Friends share directories browsable, it's possible to browse them. The entire Folder structure and the files get downloaded. By clicking on the icon, the Share Manager opens. In the Share Manager it's possible to create virtual Shares for different directories and grant different permission rolls. For details on permission levels, share flags and share manager please go to Settings/Directories. 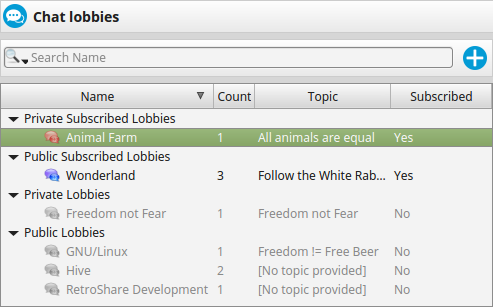 Chat lobbies are distributed chat rooms, and work pretty much like IRC or XMPP/Jabber. They allow you to talk anonymously with tons of people without the need to make friends. Chatrooms are decentralized and serverless. This means they do not require a central server and are shared between direct friends. All participants receive all messages. Once the lobby is created you can invite other friends from the friends tab. You can join all chatrooms which are subscribed by your friends. Your friends will be able to join all chatrooms which you have subscribed. This chatrooms is only visible and shared to invited members. Your friends can't see it, unless you invite them. 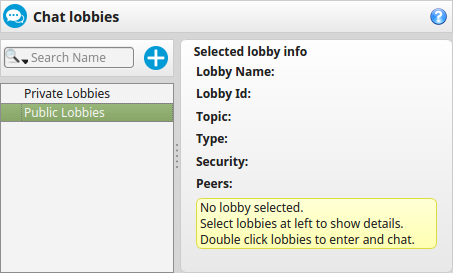 Once you have been invited to a private lobby, you will be able o see it when your friends are using it. 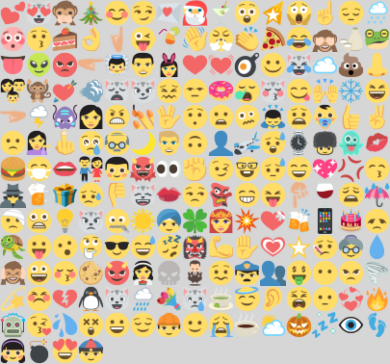 Click the Icon to create a new Chat room. The name of the Chatroom. It can't be changed afterwards. A welcome message in the Lobby room. It can't be changed afterwards. 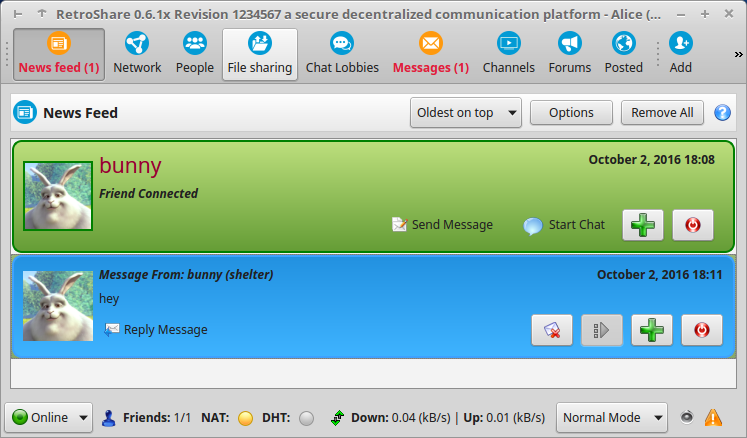 If you check this, only PGP-signed ids can be used to join and talk in this lobby. This limitation prevents anonymous spamming as it becomes possible for at least some people in the lobby to locate the spammer's node. 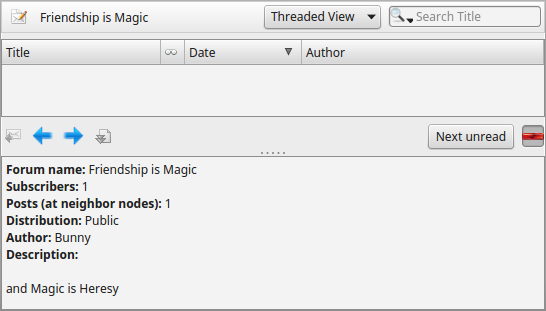 Initially send invitations to online friends of your Node. Only direct friends can join with their Identities. The choosen contacts will be invited to the join the chatroom with an identity. 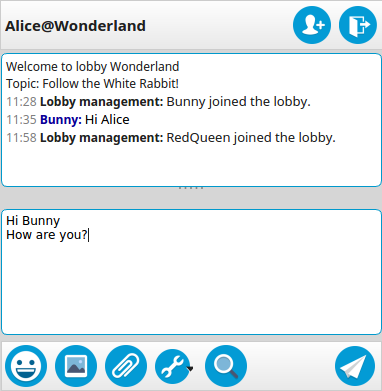 The Friend Bunny has joined the newly created Chatroom and starts chatting. Now all Friends of The Public Chatroom propagates to all Friends of Bunny and they can join as well. 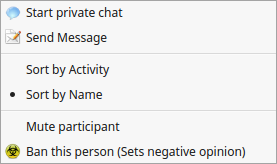 Join existing chatrooms by double clicking or right-clicking. Joins the Chatroom and adds auto subscribe. So this Chatroom will be joined also after each restart again. Note: For the chat lobbies to work properly, your computer needs be on time. So check your systems clock! 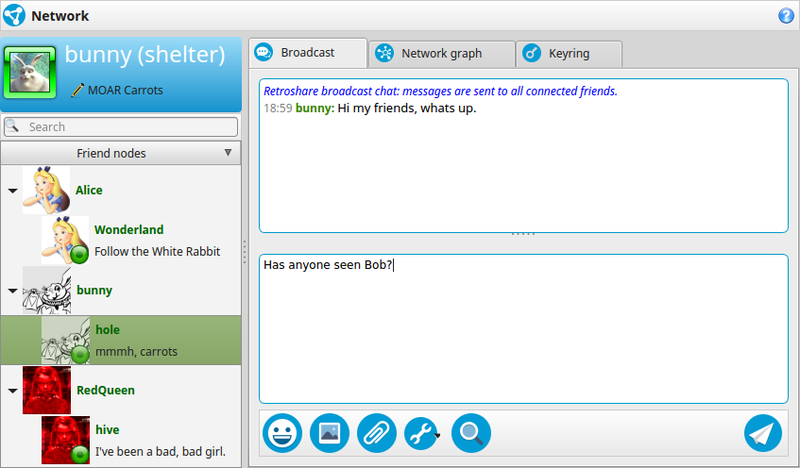 All Members of the Chatroom are shown in the list at the left. This Identity is not active in this chatroom. Hover with your mouse over the ID and some information will pop up in the tooltip. 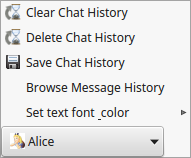 When you right-click on the Chat ID, an additional context menu will popup and show some actions. Bans the whole Identity. Does not display Content (Forum posts, Channel messages, posted links, ... ) neither does the content of this person get's forwarded to friends anymore. 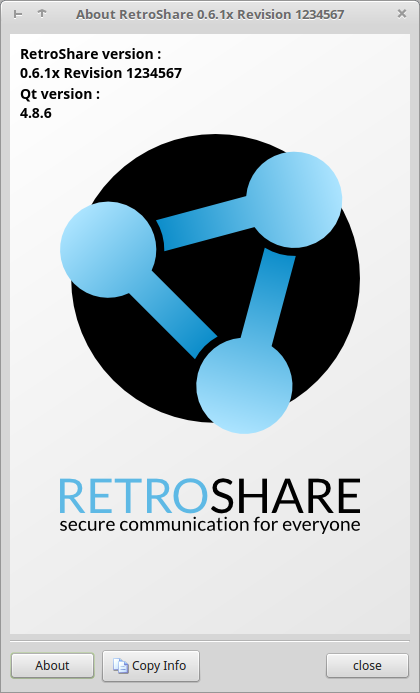 RetroShare has its own internal email system. 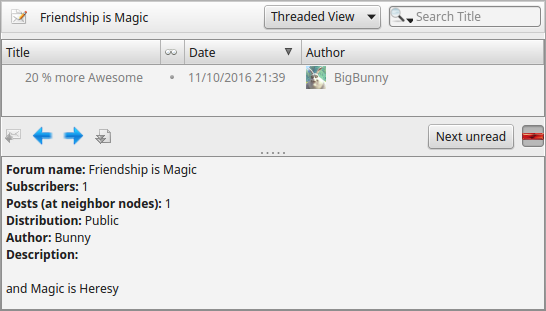 You can send/receive emails to/from connected friend nodes. 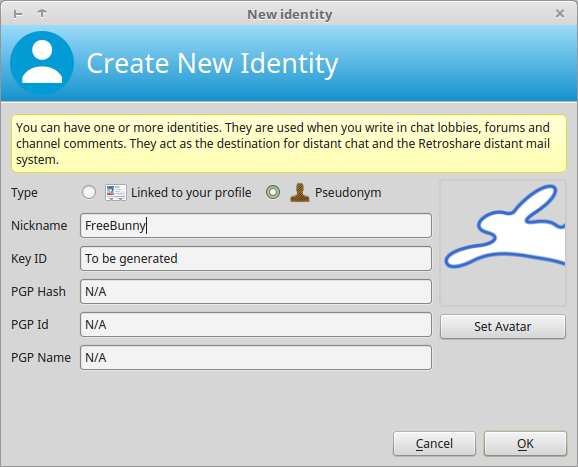 It is also possible to send messages to other people's Identities using the global routing system. These messages are always encrypted and signed, and are relayed by intermediate nodes until they reach their final destination. Distant messages stay into your Outbox untial an acknowledgment of receipt has been received. Generally, you mey use messages to recommended files to your friends by pasting file links, or recommend friend nodes to other friend nodes, in order to strenghten your networ, or send feedback to a channel's owner. Channels allow you to post data (e.g. movies, music) that will spread the network. 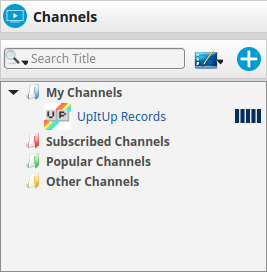 You can see the channels your friends are subscribed to, and you automatically forward subscribed channels to your friends. This promotes good channels in the network. Only the channel's creator can post on that channel. Other peers in the network can only read from it, unless the channel is private. 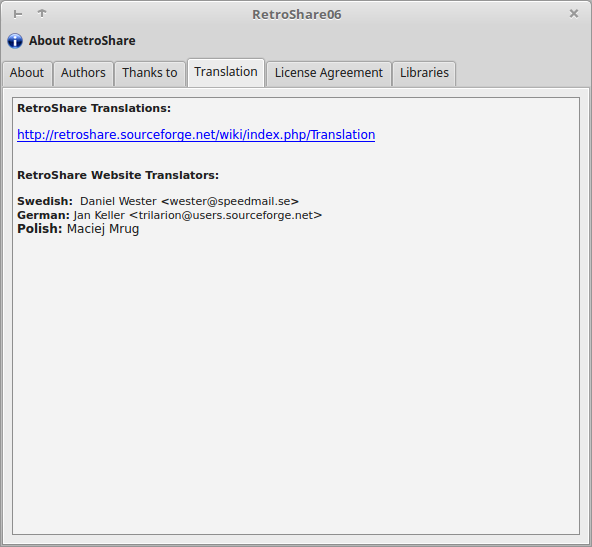 You can however share the posting rights or the reading rights with friend RetroShare nodes. 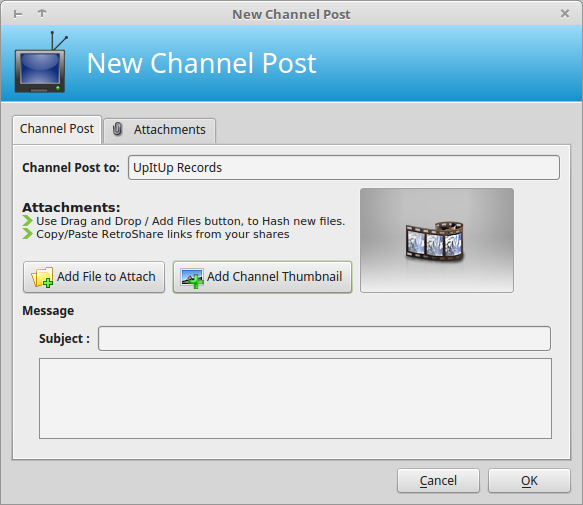 Channels can be made anonymous, or attached to a RetroShare identity so that readers can contact you if needed. Enable "Allow Comments" if you want to let users comment on your posts. Channel posts get deleted after 4 months. 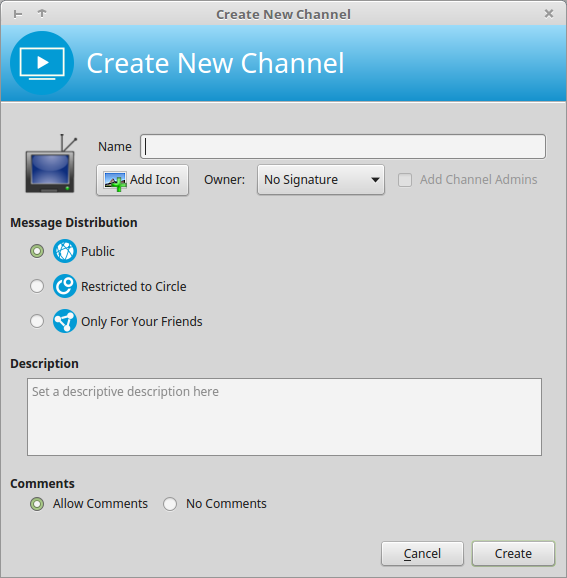 When RetroShare starts, there are no Channels available initially. 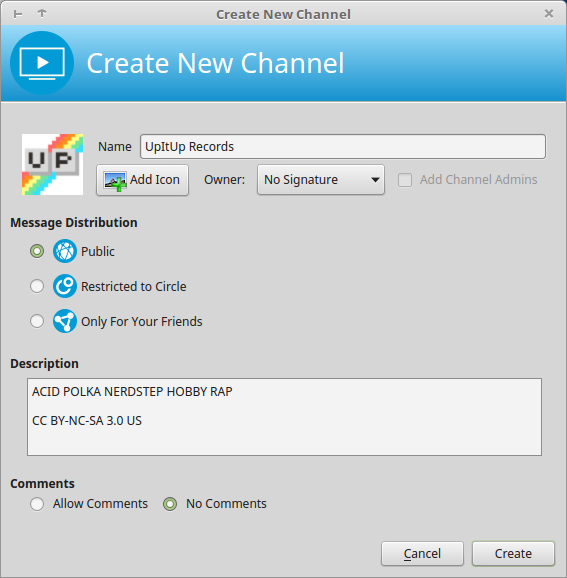 To Create a new Channel click on the Create Button. Choose a GXS-ID Identity to have the Channel signed. Message will spread way beyond your friend nodes, as long as people subscribe to the channel/forum/posted you're creating. 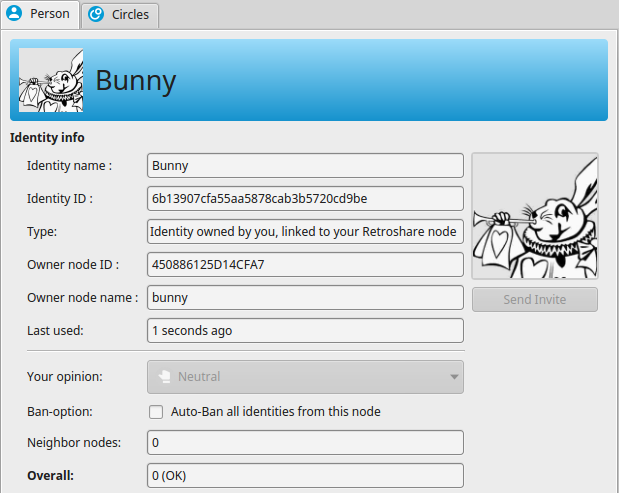 Message will spread among RetroShare nodes that host one of the identities listed as member of the circle and who also subscribe the media. Only these nodes will be able to see that this forum/channel/posted media exists. 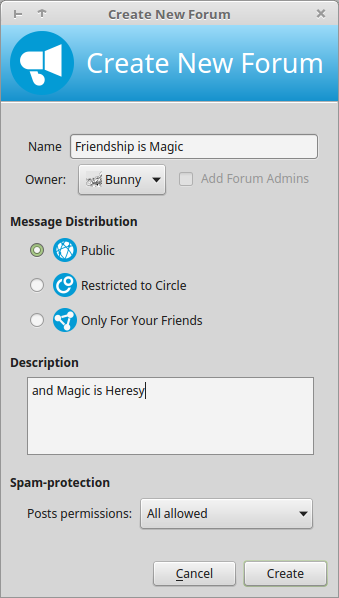 Messages will only be distributed to the selected subset of your friend nodes. They will not forward messages with each other, but only use your own node as a central hub to distribute them. The newly created Channel will be shared to your friends. They can subscribe it and re-share it to their friends. When your friends share a channel to you, it will be available in Popular Channels or Other Channels. 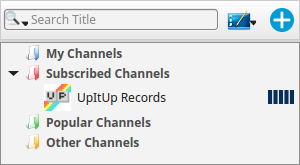 Rightclick the Channel and choose the Subscribe Button in the context menu. Click the Post to Channel Button to create a new Post. Set the title, a description, maybe an icon and attach the files you want to share in your channel. When you save your Channel Posts they should line up and get transfered to yoru friends. 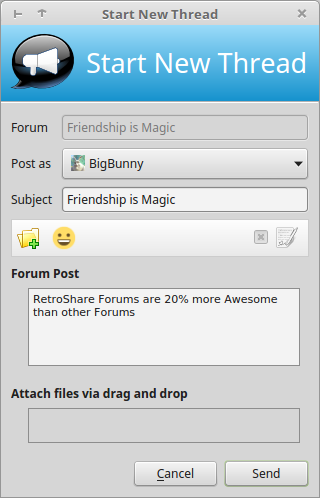 RetroShare Forums look like internet forums, but they work in a decentralized way. 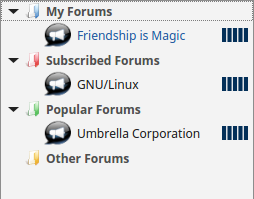 You see forums your friends are subscribed to, and you forward subscribed forums to your friends. 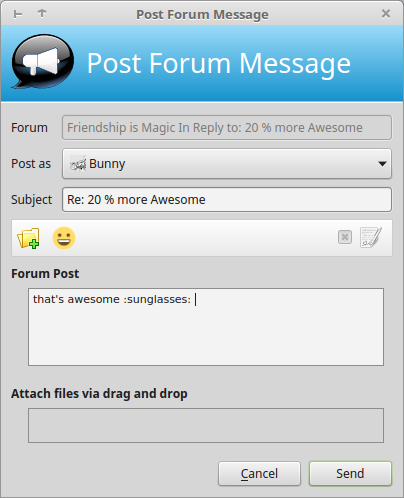 This automatically promotes interresting forums in the network. 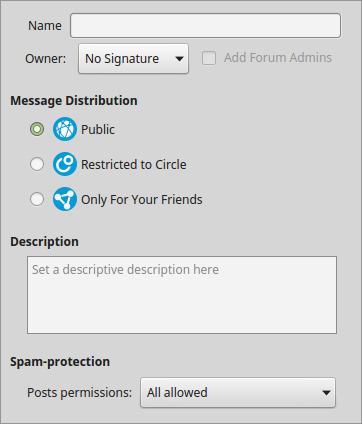 Forum messages get deleted after 12 months. 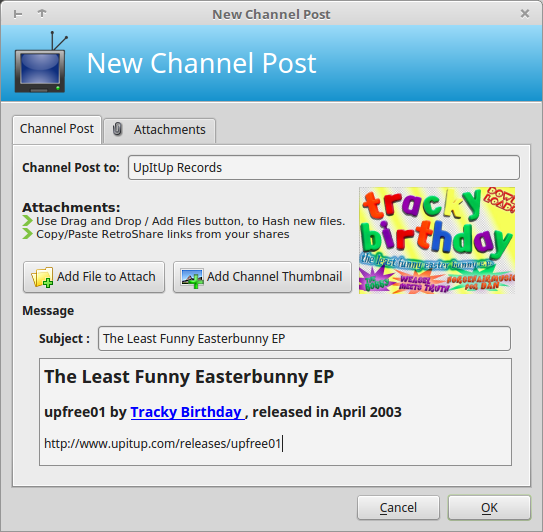 Key recipients can publish to restricted-type group and can view and publish for private-type channels. This combo box allows you to choose how posts are handled depending on the node the poster belongs to. anonymous IDs will require a reputation of 0.4 to be received/forwarded. anonymous IDs and IDs signed by unknown RetroShare nodes will require a reputation of 0.4 to be received/forwarded. 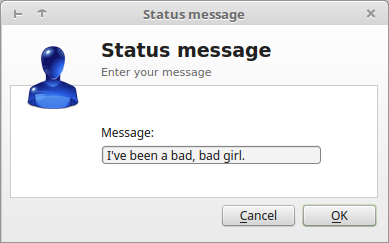 click the button, and fill in the name and select a Message Distribution Type. click on the icon to create a new post. The posted service allows to share internet links, that spread among RetroShare nodes like forums and channels. Links can be commented by subscribed users. A promotion system also gives the opportunity to enlight important links. There is no restriction on which links are shared. Be carefull when clicking on them. Posted links get deleted after 4 months. The Options/Settings are explained more detailed here. 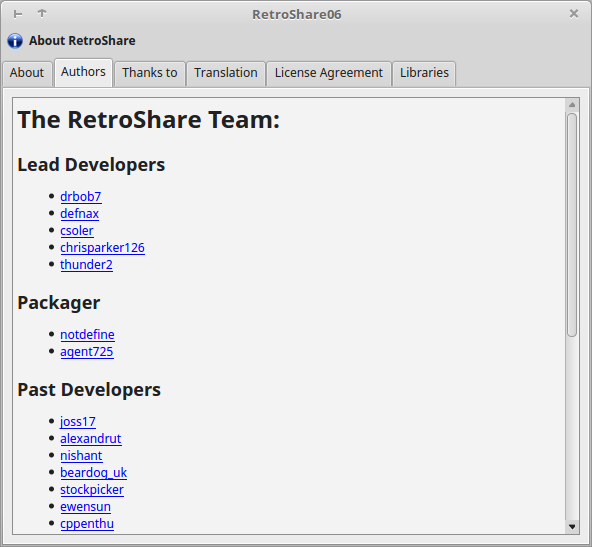 Over the years lot of different People have helped to improve RetroShare. 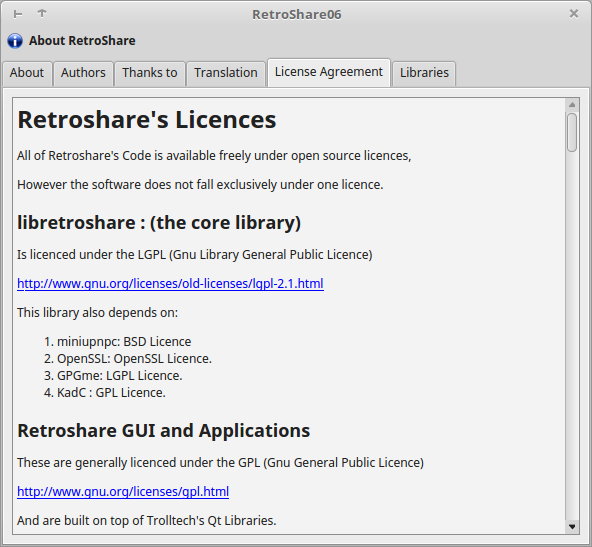 RetroShare couldn't exist without the building upon the work of other great projects. To close RetroShare click on the quit button and choose yes at the popup.